AT THE risk of initiating a political debate, only those who work within an equine industry can appreciate how deeply the horses are cherished. The bond between ‘man and beast’ is a treasured relationship equally enjoyed by the two and four-legged participants. A fine example of the mutual respect is the Lighthorsemen who risked their lives through dehydration in desert conditions by giving some of their limited water supply – little more than a canteen per rider – to their trusty mounts. That same kindred connection can fill a void in time of grief as astute horseman Greg Scholefield sadly, yet gratefully, discovered. In May 2017 Scholefield was left devastated by the sudden death of his wife of 45 years, Vicki. To Scholefield’s heartache the situation wasn’t that simple, with Vicki lying semi-conscious on the floor. “I started to hear a murmur and when I went looking to see what was happening I found her on the floor,” Scholefield explained. “I got an ambulance for her and she was taken to the hospital but passed away soon after with bleeding on the brain. “All the years together you get used to one another and take a lot for granted then all of a sudden that person is not there and it’s a major blow. “I met her while I was in the National Service around 1970 and we got married in 1972. We have one boy, Luke, who lives in San Francisco works for Google. Initially finding himself incapable of performing his usual duties, Scholefield turned to his horses to assist with the grief. “The horses gave me a reason to wake up….they still do,” Scholefield said. “You’ve got to have faith and keep pushing on, but it’s the horses and their company which keeps me going. “Not only do I enjoy having them around the place, they are the reason I get out to the tracks and socialise instead of sitting at home. “There are great people in harness racing, who outweigh the dummies, and I enjoy getting to the tracks to catch up with them. At Globe Derby tomorrow night Scholefield and his beloved stable runners could become the toast of the town when they tackle a pair of South Australia’s premier events. Labella Rock will launch Scholefield’s feature attack when she searches for a rare victory in the South Australia Derby. 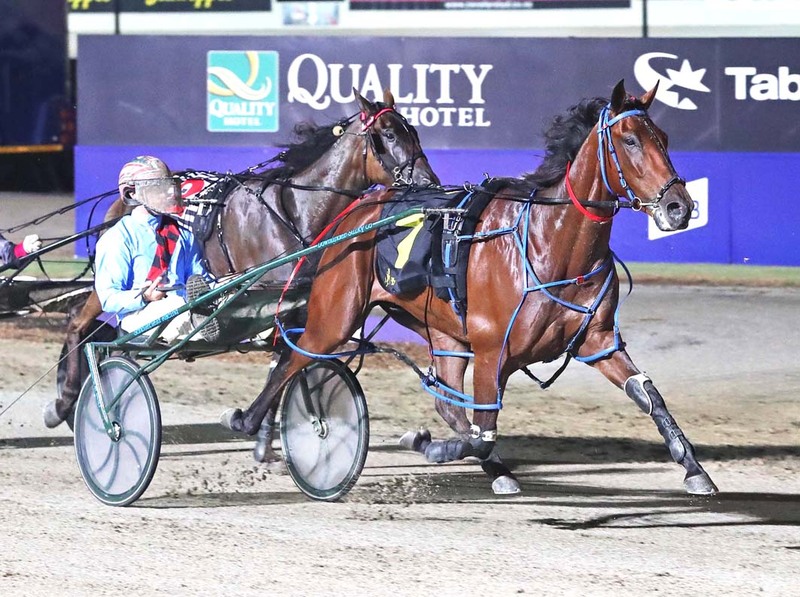 Scholefield’s stable star Emain Macha will then compete in the main event – the prestigious South Australia Cup. Ryans Day was the last local to have his name etched on the honour roll after completing an upset in 1999. “I’m confident enough with him,” Scholefield said. “He has pretty much had a perfect preparation and is feeling terrific. As much as he would be thrilled to see both or either make their way into the winners’ circle, Scholefield stated he will be happy “solid” performances and their company on the long trip home! “Of course I would love to see them win, but no matter what I’m sure I will be proud of their effort,” Scholefield said.